In the first of our series on smart phone apps, we look at some helpful apps for the newer trader. Walk down the aisle of any major retail store to where the greeting cards can be found and pick any card that when opened begins a song and/or greeting. You hold an item that has more advanced computing than existed in the world prior to 1950. Technology has steadily marched forward both in terms of progress and realized potential. Likewise, over the years, stock market transactions have evolved from gentleman’s agreements under the Buttonwood tree on Wall Street in the 1800s to tickertape quotes in the early 20th century to the 21st century where any computer with internet access gives you access to virtually any market in the world. Now, phone applications, or phone apps, make it possible for traders to gain access to the markets, research and conduct trades with breathtaking ease without the need of being tied to a computer or carrying around a laptop. From Main Street to Wall Street, traders and investors are empowered like no other time in the history in the markets that had once been the sole privilege of wealthy institutions and fund managers. Today, almost every major brokerage and trading service now offers you a custom app that has a unique set of features to help you make informed trading decisions right from your phone or tablet. Apps give you a host of functions to execute those trades whether you are buying or selling, and whether you’re calling from a remote corner of the world (that has internet access). Even better, most of these apps are free, giving you access to services like real-time quotes, charting services, breaking headline news, earning reports and more. 1) What markets to trade: Decide on the market you’re going to trade, whether it’s going to be stocks, forex, commodities or other financials. Each market is going to have its own unique set of data feeds. 2) What type of market you trade: There is a big difference between trading equities, futures and options. Trading stocks on margin is a much different animal than trading stock index futures on margin. Currency options are worlds apart from both cash stocks and futures. The app you use has to accommodate for the product you’re going to trade and you have to make sure the app is going to give you the necessary data to make effective trade decisions. 3) What time period are you trading? Make sure that the phone app complements the time frame that you find yourself actively engaged in. Day trading the SPX E-minis is going to be a frustrating experience if you don’t get real-time data or, worse, if the app is buggy and doesn’t transmit the data effectively causing you to miss critical buy and sell signals. To being our series of app reviews, we’ll start by looking at some general apps focusing mainly on stocks. 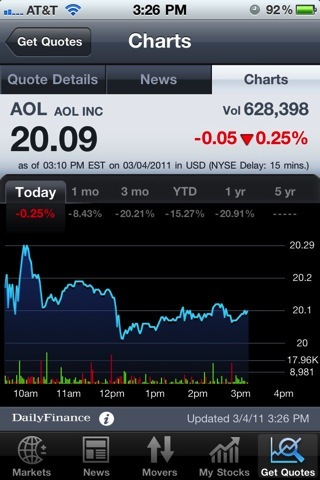 *For really good overall apps for general use such as quotes, basic charts, and news, there are two free choices: Yahoo Finance app and AOL’s Daily Finance app. Yahoo! 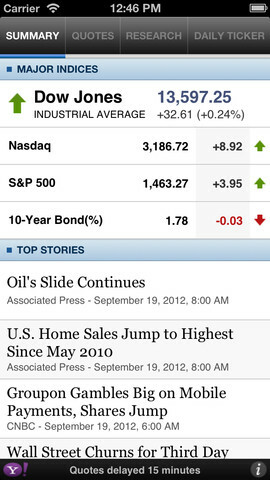 Stocks is the workhorse of financial apps and is the default app of choice that comes automatically with new iPhones. It’s an intuitive and easy-to-use app for even the most technology-challenged user to check quotes and updates on stocks. The Daily Finance app has real-time stock quotes and general use but has the added benefit of giving you the ability to track and manage multiple stock portfolios. If you designate stocks for value-, growth-, momentum-investing and/or trading, then this app can help you segregate stocks to portfolios based on their particular profile, and help you keep track of their performance.